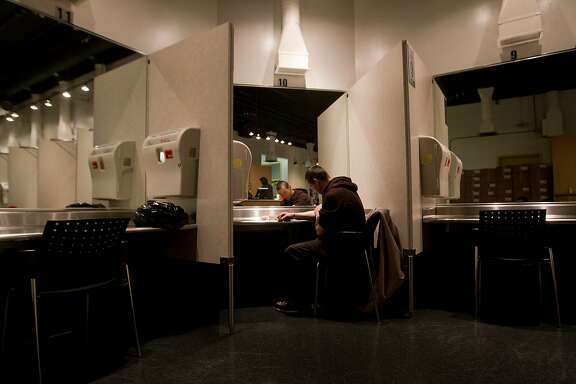 San Francisco has more than 20,000 injection-drug users. Injection sites are an innovation that can reduce fatal overdoses by addicts and accidental needle sticks on the streets. The idea of a city-sponsored drug-injection site at first sounds baffling and dangerous. To some, providing comfortable quarters and needles to shoot up is the last thing a city should do to curb drug users sprawling across sidewalks and parks. But San Francisco, along with other major cities, is on track to do just that — and the plan makes sense. It’s a real-world answer that can lessen a runaway problem, prevent deaths and offer a pathway from addiction. Safe-injection sites have found support and success in dozens of cities in Canada, Europe and Australia. Between now and July, city Health Director Barbara Garcia plans to clarify the scope and operations of the local sites. Her department has worked on the idea for months, mindful of the legal and health hazards that go along with enabling illegal drug use. There are reasons for caution, but the idea is neither far-fetched nor implausible. San Francisco has more than 20,000 injection-drug users, a figure that accounts for a demoralizing sight of discarded syringes and open drug use throughout the city. Anyone walking by a huddled group splayed on the pavement should want the city to come up with an answer. Offering a controlled setting indoors can help. It’s expected there will be medical oversight and counseling, clean needles, and safe surroundings. Police involvement to prevent drug sales needs to be worked out. Until now, San Francisco and other cities were stalled over legal and perceptual problems. Opening the doors ran afoul of a raft of laws barring drug use. The city could be liable if an addict overdosed. Even an ever-tolerant city wasn’t completely sold that allowing serious drug use would produce anything but trouble. But city leaders are sidestepping legal issues by lining up private organizations to provide the money to run the sites, which will begin with two locations with more to follow. Overdose fears haven’t been borne out elsewhere. As for public unease, San Francisco has become more upset over rampant drug use than over any doubts about a promising innovation. This city won’t be alone. Philadelphia announced last month it will work with local groups to open injection sites. Seattle, Denver and Baltimore are also moving in the same direction. Fueling the urgency is a wave of drug deaths linked to opioids and heroin that totaled 63,000 fatalities in 2016. That astonishing number, larger than U.S. combat deaths in Vietnam, is easing official reluctance city by city. The spreading plans could be curtailed if the Trump administration chooses to block the sites through drug raids or court challenges. But that worry is too uncertain to stop a groundswell idea that needs to get under way. At best, the injection sites can dent a much larger problem. There needs to be more emphasis and money for medical treatment, rehabilitation and programs that treat addiction, not punish it. That leadership is missing in Washington, where the president’s endless emphasis on drug crime masks his failure to provide serious leadership. Injection sites are an innovation that can reduce fatal overdoses by addicts and accidental needle sticks on the streets. The status quo is intolerable. It’s time for San Francisco to give them a try.